This luxurious and easily accessible modern building on Prince Sultan Street provides spectacular views of Jeddah's streets from a choice of furnished or unfurnished offices on the 12th floor. Your business will surely benefit from the area's high footfall and popularity. Here, your business can take advantage of the space's turnkey solutions, with adaptable spaces which you can furnish to meet your specific business needs. With a strategic location and an array of impressive facilities, this modern service office provide a perfect platform to grow your business, backed-up by friendly and knowledgeable staffs. Tenants are afforded an excellent view of the city and the Red Sea. It is located in Jameel Square at the heart of Jeddah’s business district. Housed within a landmark building which is also occupied by major domestic and international corporations. 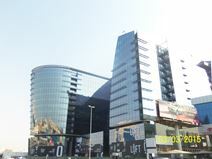 There are plenty of nearby shopping malls, retail shops, sophisticated offices and a great transport access. On-site parking facilities are also available. Accessible 24 hours a day means the workspace is suitable for any kind of working hours. Here, you can also make use of the on-site meeting rooms, so, if you meet with clients often you have somewhere to chat. The centre is located in a strategic location that is connected to Jeddah, Makkah & Madinah through The Haramain High-speed railway. Also within walking distance you'll find many local cafes, bars and restaurants to make use on a lunch time or during an evening whilst entertaining your clients. Offering a sophisticated and stylish business environment on a budget, these serviced offices are based in an iconic 37-storey tower, and are well-equipped to meet your business needs. Located in the most sought-after avenue in the city, and less than half an hour from the airport, it is ideal for companies with international clients. Your business address will boast the highest degree of luxury and sophistication at a fraction of the cost. However, the centre also provides you with access to the centres' powerful technology infrastructure and dedicated support team to ensure your success. 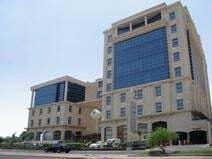 This building is spread over 12 floors in one of the most prestigious business areas in Jeddah, on Prince Sultan Street, where your company can establish an impressive presence upon occupancy of the space. The building benefits from beautiful architecture and a classy interior while tenants are close to a variety of amenities including health clubs, restaurants and cafes where you can accommodate clients. With four levels of parking, roof gardens and water pounds this newly built 14-storey tower is located on Prince Sultan Street in the heart of Jeddah, a 15-minute drive from the airport. This business centre is the perfect workspace solution for those with international clients or require frequent travel. A range of flexible office space and meeting rooms are available for collaborative projects and negotiations. This business centre located on Prince Sultan Street in one of the most of the iconic buildings in Jeddah. Offices come fully furnished and pricing is all inclusive. The centre is accessible 24 hours a day so is well suited for any kind of working needs. Here, you have plenty choice when it comes to choosing your office, whether its a window office, interior office, office suite including meeting room or a co-working space. 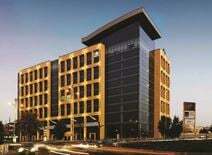 Located in an iconic and innovative new piece of architecture, this luxury serviced office centre is sure to impress. Located in a prestigious district that is home to many international corporations, this centre is stylish and well connected. The neighbourhood is home to a development bank group. Also featured is a courtyard, air-conditioned all year round for comfort. The area is served by King Abdul Aziz International Airport and the rail. With Jeddah Airport only 15 minutes from this prestigious location, it is ideally situated for domestic and international business. The newly built tower has water ponds and roof gardens as well as 24-hour security and access to meeting rooms. There is also a secretarial team on hand to assist in greeting and managing your incoming clients. You will benefit from high-connectivity with Wi-Fi provided as well as a close proximity to an abundance of transport links and hotels.